This CMV test measures CMV IgG and IgM antibody blood levels to help screen for a cytomegalovirus infection. What is the CMV test? The CMV test measures the CMV IgG and IgM antibody blood levels. Why is the CMV test important? This CMV blood test can help identify a CMV infection. This CMV Test is a blood test. The CMV test, also known as a CMV lab test, CMV blood test and a cytomegalovirus test, measures the CMV IgG and IgM antibody blood levels. Cytomegalovirus, or CMV, is a type of virus that infects humans as well as monkeys. The human cytomegalovirus version (HCMV) is known as human herpesvirus-5 (HHV-5) and was first identified in the late 1800s. CMV is thought to be transmitted by droplets from an infected person and can also be spread by breast milk and by sexual activity. A CMV infection can cause a fever, glandular swelling and pain, and a sore throat. While most healthy people have no symptoms when colonized with CMV, CMV infections can be particularly devastating to immunocompromised individuals, the elderly and infants. The CMV test consists of the CMV IgG test and the CMV IgM test and checks for CMV antibodies that indicate a CMV infection. CMV IgG antibodies typically increase after a recent infection while IgM antibodies tend to stay elevated for weeks to months after an infection. As a result, in combination, this CMV test is helpful for determining both recent and chronic infections. Once infected, a person will typically have a measurable CMV antibodies in their blood for the rest of their lives. Typically, someone with an active CMV infection will have a significant rise in both CMV IgG and IgM antibody levels. To get a CMV test near you, just order online and get your blood drawn at the Quest Diagnostics lab you selected. As soon as your CMV lab results are ready, the will be available for download. 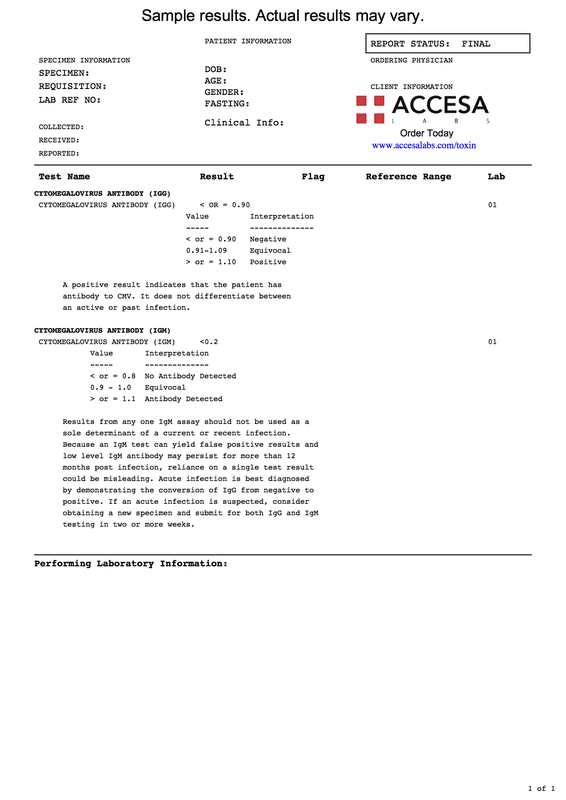 As can be seen on the sample CMV lab test report above, CMV IgG and IgM levels will be reported as a numerical value and can be compared against the reference range provided by the lab. CMV Test at Guaranteed Prices.